I was talking to a friend the other day about the new NBC Olympics logo, as well as the changes to Olympic events, such as wrestling being dropped from the Summer Games program as of 2020. This led to a discussion over "alternative" sporting events, such as those sponsored by Red Bull and, of course, ESPN's X Games franchise. The broadcast logo fan in me started to dig into the branding for the X Games and unlike its Olympics counterpart, there haven't been many substantial changes to the X Games logos since the event debuted in 2005. 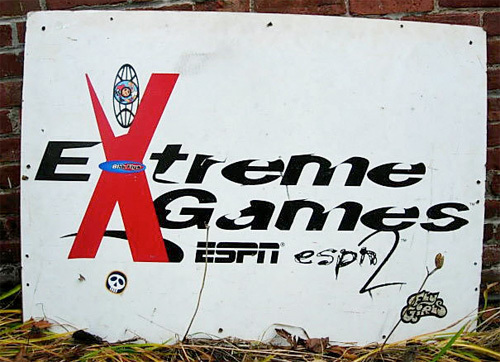 Aside from the name change (originally known as the Extreme Games), the biggest occurrence happened in 2004 with the adoption of the current "X" logo that is still used in today's events. 2003 was the final year of the vertically-biased X logo, which definitely has a dated 1990s look about it. Wow. That 1995 logo sure is a piece of work. Boy I remember those days. I was a graphic design student in college from 1993 to 1997. So 1995 is right in the heart of those days. People were all freaking out about computers. And then some people (I guess I can call them designers) would do the grunge treatment via computer. Oh wow. Good times. Good times.